In March, I wrote a post on why businesses should be thinking about impending challenges we face in water management – and supply. Almost six months later, as the World Bank brings together another meeting of the International Water and Resource Economics Consortium (IWREC) and the Asian Development Bank has just wrapped up the fifth Water Loss Asia Conference , the topic has only grown more prescient. The theme of the annual IWREC meeting this year is “Water Security in a Changing World”. What a theme. With that in mind, I want to look at what, to my mind, are four of the most critical challenges impacting water management. International conflicts are both a cause and effect of water insecurity. Military action destroys infrastructure and depletes resources, while water is also used as a weapon. For years, a key tactic by ISIS has been to seize water supplies such as rivers and dams , while in Syria water transport infrastructure has been a key target when laying siege to cities .Of course, not all of those affected by a cut in water supplies are combatants. A lack of access to water puts lives but also livelihoods at risk – for example, as farmers can no longer irrigate crops or keep livestock healthy. Resource access is a major driver of involuntarily migration, and is one reason refugees are flooding from the region in search of safer terrain . This then creates uneasy dilemmas for countries about how to – or not to – receive these refugees, which as we see in Europe can lead to significant upheaval. What seemed to be an ever-tightening mesh of global connectivity is starting to fray , driven in part by unemployment and nationalist sentiment.Rightly or wrongly this has severe impacts for international relations and cooperation. Water supplies crossing borders will need a collaborative approach to conservation, which will not flow between countries bent on building up walls between each other. And while global temperatures rise , adding to the challenges faced by water-stressed countries, trade will be a critical element in supplying water to those in need. A political environment averse to trade and cross border cooperation will make this all the more challenging. Even in countries not currently blighted by conflict, water supplies are under threat. Aging infrastructure and consolidation of ownership create major risks to drinking water. Recent spates of incidents involving tainted water supplies show the problems here, most notably in the US where water supplies in Flint, Michigan were found to be poisoning drinkers . These incidents have damaging impacts on their victims but highlight methods of storage and transportation developed during a much earlier time and in dire need of resource to improve and develop.A challenge to developed nations exists here. Infrastructure projects like these come at significant cost, and with ageing populations putting increasing strain on public budgets , water isn’t the only resource being squeezed. And last but certainly not least: climate change. Climate change will be hugely impactful on our access to water. As storms worsen, flooding causes contamination of clean supplies and damage to infrastructure.Similarly, rising sea levels will cut off access to clean water and drive people from urban centres located on shorelines, potentially moving them away from areas with greater supply capacity.As mentioned earlier, rising temperatures will have major impacts here as well. 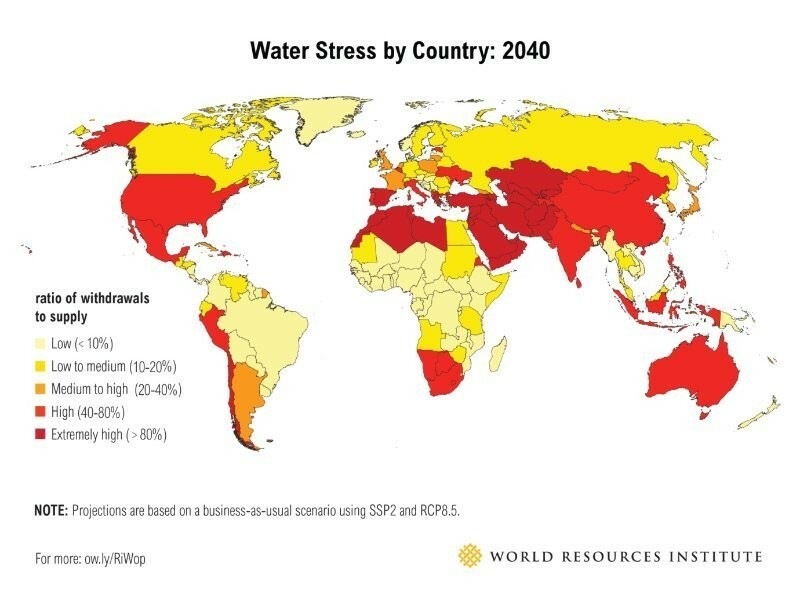 The World Resources Institute released projections last year of countries’ water stress levels in 2040 . The result of all of these factors will be a major challenge in supplying individuals and industries with the water they need to live, let alone thrive. Agriculture will take a major hit, with yield outputs cut by 50 per cent in some regions by 2050 . This is critical in keeping people healthy and employed. The denigration of either factor will have profound social, economic and political implications, which will be felt by businesses everywhere. Businesses should be factoring these indicators into risk modelling but also acting proactively to build resilience to water shortages where possible. They should also work to promote innovation and collaboration on improving water management systems, particularly between nations in high water-stress regions.